Various large and small presses can be used in the blacksmith shop. Arbor presses, flypresses, hydraulic presses, and punch presses. Some are good for forging and some are not. 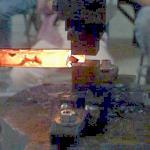 However, those not useful for forging have other uses such as blanking and bending. Click for Detail What IS a fly press? A fly press is a flywheel driven press. It operates on inertia. The flywheel is attached to a screw that moves the ram up and down (see detail of image above). When the tool on the ram contacts a piece of work it must slow down and stop the flywheel. This produces a tremendous amount of force. Fly presses are designed to be stalled (stopping the flywheel). When stopped hard, the frame stretches and it will actually reverse the flywheel rotation as the frame returns to normal. Click for Detail This is a Punch Press. It has a similar uses as a fly press but is mechanically different and its character of operation is considerably different. This particular punch press is known as an OBI (Open Back Inclinable) press. It is shown in a typical incline position. It can be adjusted about 45° forward or back to allow stamped parts to fall out OR can be leveled to other machines. Punch presses also operate by inertia. The motor powered flywheel is engaged to a crankshaft by a clutch and the press makes one cycle down and back up (in theory). The punch press MUST travel full stroke. It cannot be allowed to be stalled. It is designed to absorb only about 15% to 20% of the fast turning flywheel's energy while punching, bending or forming. If it is stalled by too heavy a work piece then the machine must absorb 7 times to an almost infinite force. Something almost always breaks catastrophically when a punch press is stalled. Due to the stalling hazard tooling for punch presses must be carefully engineered. Simply increasing the material to be punched by 1/16" or using a slightly larger punch may overload and stall the machine breaking its crank shaft or cause a punch to shatter. FORGING: Punch presses are generally not suitable for forging because of the need to travel FULL stroke with every cycle and the need to know the exact forces involved. If a job can be done cold within the rated capacity of a punch press then it is safe to do it hot. Punch presses ARE NOT a power hammer and cannot be converted into one. SAFETY: Mechanical clutch punch presses are rapidly being retired from industry by the millions because of various safety problems. They are almost impossible to bring up to OSHA and insurance company standards. One problem is that it is difficult to make them "fool proof" to operate. Modern presses must be equipped with dual hand operated switches a suitable distance apart so that the operators hands absolutely cannot be in the way when the press is cycled. 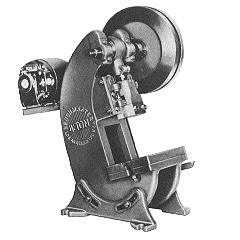 Most of the old presses were made with foot operated clutches. The other problem is that the old dog type clutches are commonly known to double or triple cycle on random occasions. This unpredictability makes it unsafe to hand feed part into them which is common practice. I have a press like the one above and two old 12 ton punch presses and they all double cycle. All new presses are equipped with fail safe air clutches and dual controls. As individuals, you and I can choose to use these old machines but industry or anyone with employees can not. 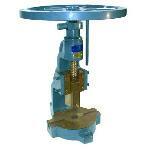 DIY Manual Hydraulic Presses Updated article. Manual hydraulic presses are slow but safe to use and generate tremondous forces in a small relatively inexpensive machine. They can be used for cold punching, bending, forming and coining. 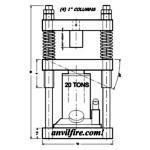 Even the largest do not compare to small fly presses or hydraulic presses in force. At their maximum rating they require a LOT of input force and may be uncomfortable to use. They are almost as slow as a hydraulic press on the return operation due to the ratchet mechanism on the larger models. However, they are quick on the down stroke. Due to the ratchet mechanism they are a push only device. The return is by a handwheel with little mechanical advantage. They do not have a rigidly guided ram and the long length makes the problem or wobble worse. The end of the ram is flat and not designed for holding tools. To hold tools on the ram it must be modified or have an adaptor fitted. Arbor presses can be used for light press work with die sets or specialy adapted tooling (see links below for press capacities). They can also be used for light bending. In this regard a dial indicator can be used to make repeat precision bends. FlyPresses.com Articles and application data. Punching Force Chart and calculator for punching holes in steel. Riveting Force Chart giving steel rivet heading forces.